No. 24 Nebraska played sound basketball for 31 minutes on Wednesday night. Unfortunately for the Huskers, a college basketball game is 40 minutes and those last nine were a disaster as the Huskers gave up a double-digit lead in an 85-78 loss at Minnesota. The Golden Gophers (7-2, 1-1 Big Ten) outscored the Huskers (7-2, 1-1 Big Ten) 27-10 over the final 8:42 to turn a 10-point Nebraska lead into a seven-point loss at Williams Arena. Minnesota shot 51.8 percent from the field, snapping a streak of 17 straight games the Huskers have held their opponent under 50 percent from the field. That percentage is the highest the Huskers have allowed from the field since a 93-57 loss to Michigan on March 5, 2017 that saw the Wolverines shoot 63 percent. Junior wing Amir Coffey finished with a career-high 32 points, six rebounds and six assists while senior forward Jordan Murphy added 18 points and 13 rebounds. The duo combined to shoot 22-of-27 from the free-throw line as the Gophers outscored Nebraska 24-15 at the charity stripe. Senior Isaac Copeland Jr. led the Huskers with 17 points on 7-of-15 shooting (3-of-5 from 3) and seven rebounds. Junior Isaiah Roby had a season-high 15 points on 5-of-13 from the field (0-of-3 from deep) and 5-of-6 from the line, three blocks and two steals but only grabbed four rebounds in 31 minutes. Senior Glynn Watson Jr. recorded 14 points on 4-of-8 shooting with four assists in 38 minutes. James Palmer Jr. was held scoreless in the second half, finishing with 11 points on 3-of-14 shooting (1-of-6 from 3). The Huskers shot 45.9 percent overall but only 38.5 percent in the second half including 3-of-12 during the 27-10 finish by Minnesota. The Gophers outscored Nebraska 50 to 36 in the paint. The Huskers got off to a great start, hitting five of their first six shots to take an early 12-4 lead. Minnesota scored back-to-back buckets but Copeland knocked down a triple to push the lead back to seven. The gap bounced between nine and five for much of the half until Coffey put the Gophers on his back. He ripped off a personal 11-4 run to tie the game at 32-all. Jordan Murphy scored inside to give the Gophers their first lead since 2-0 then Coffey hit two more free throws to put Minnesota up 36-34. Coffey picked up his second and third fouls in the span of 15 seconds, the latter of which followed an offensive rebound by freshman center Brady Heiman who gave the Huskers a big spark off the bench in the first half. Heiman hit all four of his shots for eight points in eight minutes and he went on to finish with nine points, five rebounds and a block in 15 minutes. Meanwhile, Coffey had to take a seat for the rest of the half and the Huskers took advantage. Palmer scored four straight to tie the game. Murphy put the Gophers up with a dunk but Nebraska scored the next eight points including two buckets by Heiman. Freshman guard Gabe Kalscheur drew a foul on a 3-point shot but only made one of the freebies and the Huskers took a 44-39 lead into the locker room. The highlight of the first half was courtesy of Roby, who welcomed Minnesota freshman Jarvis Omersa to the Big Ten. The Huskers spent much of the first half in the open floor, turning eight Minnesota turnovers into 15 points and notching 13 fast break points. The Huskers opened the second half with an 11-3 run to take their biggest lead of the night – 13 points – and they kept the Gophers at an arm’s distance over the next 10 minutes. Minnesota cut it to eight a few different times, but the Huskers responded each time to build it back up. Nebraska ran out of answers around the 8-minute mark, however. Sophomore wing Nana Akenten knocked down a 3-pointer — his only shot of the game — at the 10:20 mark to put the Huskers up 67-56. Nebraska didn’t hit another shot from the field for more than five minutes. Minnesota closed the gap to four at 69-65 after a three-point play by Coffey that gave Copeland his fourth foul, sending him to the bench. Watson hit a step-back jumper to snap the Huskers out of their cold spell but Minnesota answered with a 3-pointer by Dupree McBrayer, just the second triple of the game for the Gophers. Watson hit a pair of bonus free throws to push the lead back to five. Then the Gophers took control with a 9-0 run capped by a 3-pointer from Coffey that put the Gophers up 77-73 with 2:26 to play. After a quick 30-second timeout to regroup, Watson snapped the run with a bucket at the rim, but Minnesota answered on the other end with a layup of its own. Watson drew a shooting foul but split the free throws and Coffey scored at the rim. 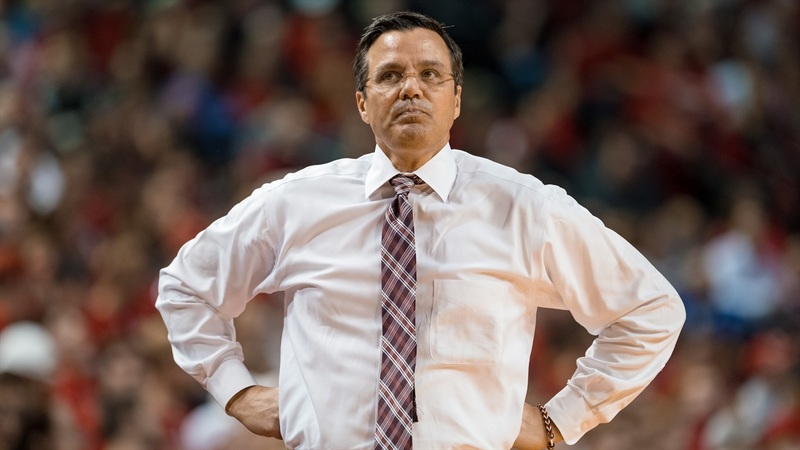 Copeland scored for Nebraska to make it a one-possession game at 81-78 with 43 seconds to play and Tim Miles called a timeout to set his defense. Minnesota ran down the shot clock and the Huskers got what they wanted, an outside jumper by Coffey that missed, but Nebraska couldn’t track down the rebound and Roby picked up his fifth foul trying to scramble for the ball with 10 seconds left. Murphy hit two free throws to seal the game, then added two more after Watson missed a desperation 3-pointer. Minnesota scored on 12 of its final 15 possessions. The Gophers only hit three 3-pointers all night, but two of them came during that late run. McBrayer, a senior who was responsible for one of those big triples, played in the game after losing his mother, Tayra McFarlane, to breast cancer on Monday. The Huskers wore warm-up shirts with “RIP Tayra” on the front prior to the game and Tim Miles shared a moment with McBrayer afterward. The Huskers will return to Lincoln to host in-state rival Creighton on Saturday evening. Tipoff at Pinnacle Bank Arena is set for 5 p.m. on BTN.